Gili Exe Lock can lock any executable programs on your local computer,a person can not run the locked programs without a password. If you do don't want other persons to use your tax preparation software, personal finance or other programs you like, you simply need to run this application. 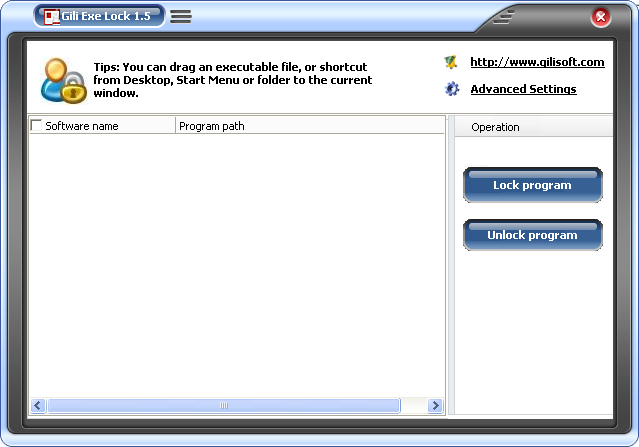 Gili Exe Lock's features:Easy to use, Support locking 32 or 64 bits Program, Password Protected. Easily lock any programs installed on your local computer. * Easy to use :In order to lock a program,you can drag an executable file, or shortcut from Desktop, Start Menu or folder to the main window . * Support locking 32 or 64 bits Program : Gili Exe Lock supports any executable programs on your local computer. * Password Protected: This is a password-locked software,that is to say,there's no other way to run or unstall it if you have not the password. Lock your programs, protect your privacy -- VERY EASY TO USE! Minimalist digital clock. Free. Virus and spyware free. 4S Lock protects your PC from unauthorized access and automates PC cleanup. Simple strong file encryption command line utility with complete source code. IziLock - Lock your folders with a password! Lock, hide, and password-protect your all private files and folders. Use multicoloured shapes to build large blocks of colours. BlocKnock - Your favourite Tetris remake! Download File Lock to Protect or hide any of your files, folders and drives! WebExe converts HTML pages into standalone, self-running EXE files. Qweas is providing links to Gili Exe Lock 2.0.13 as a courtesy, and makes no representations regarding Gili Exe Lock or any other applications or any information related thereto. Any questions, complaints or claims regarding this application Gili Exe Lock 2.0.13 must be directed to the appropriate software vendor. You may click the publisher link of Gili Exe Lock on the top of this page to get more details about the vendor.